I thought I’d try a new feature. It’s called Menu Plan Monday. Every Monday I will share what we plan to eat for the week. I made four loaves of bread today so we can eat lots of sandwiches for lunch. I also made a double batch of chocolate chip cookies so Bella will have a special treat at VBS this week. Saturday – My stepsister and family are coming in town so we will likely be eating at my parents. Sunday – We have a potluck dinner at Bible study. I’ll likely take some fruit and whatever else the host requests. What do you think? Is this helpful? 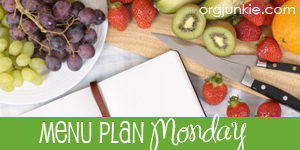 This post is part of Menu Plan Monday. What are zucchini boats? The thought intrigues me and I know our market has lots of zucchini these days…I just don’t always know what to do with it, so often it stays there. Too funny – I was just thinking I need to start doing the Menu Plan Monday when I saw this in my inbox. And we’re having VBS this week, too!